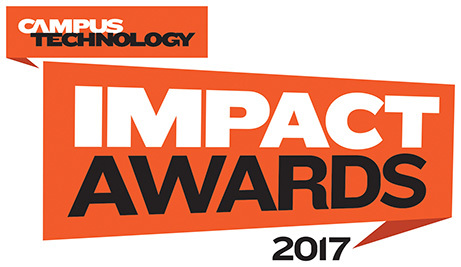 (MCLEAN, VA., August 1, 2017)— Campus Technology has officially announced the recipients of its 2017 Impact Awards (formally the Innovators Awards). After a nomination process that brought in submissions from across the country, 10 honorees were selected in five categories. Celebrating 13 years, the Campus Technology Impact Awards recognize colleges and universities that are making an extraordinary impact with technology on campus, doing important work in the service of teaching, learning, administration and operations. These projects, both cutting-edge and well established, have made their mark on campus and on the higher ed community at large. "When you consider the use of technology in education, one of the most important factors is impact — how it benefits students, improves teaching, streamlines costs, contributes to the community, furthers the institutional mission, etc.," said Rhea Kelly, executive editor of Campus Technology. "These 10 projects are making a difference in higher education in variety of inspiring ways, and we are so pleased to recognize them with this year's Impact Awards." A free app transforms students' smartphones into instrumentation in the physics lab. A web application helps learners explore and easily document relationships among visual materials. A quantified-self app tracks students' study behaviors, evaluates behavior changes and improves retention. A digital concierge connects students to learning programs and services worldwide, including augmented and virtual reality content. A visual, interactive collection of high-level metrics taps into the culture of the institution to influence informed change. A technology recycling program fulfills unmet needs by reconditioning and redeploying computers while engaging volunteers from local schools and underserved communities. A global consortium opens up access to widespread digital resources and works to improve the learning experience with technology. A migration of e-mail, website and ERP systems from on-premise to hosted services results in a true culture shift, new skills, new support processes and changes in workloads. An inclusive space within the OU library connects students to cutting-edge digital learning tools. A public/private partnership between RIT and NY State explores the intersection of digital media, film, games and entrepreneurship, providing advanced technology for education development. All winners will be featured in the October issue of Campus Technology and on www.campustechnology.com October-December.